This stovepipe slip connector is used to connect stoves to their chimneys. Since it is a slip connector, it can be adjusted from 3" to 9". 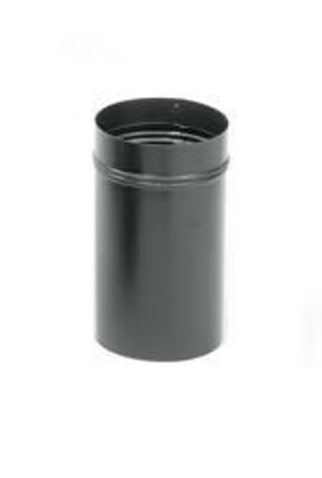 It is made from sturdy 24-gauge steel and comes in a sleek black finish to match your other stovepipe components. This item requires an 18" clearance to combustibles. The seams snap together with the easy connection that is the hallmark of all the Snap-Lock products. The dimensions of the connector are 11.5" L x 8" diameter. Could you please explain how this adjustable? The one end (male) is made in a way that allows it to be slide (slips) over the pipe it connects to and slides for adjusting. It will work with 8" ID single wall stove connection pipe.